When a call sounds this good you better camouflage it. This call redefines "in your face" duck hunting. 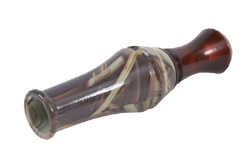 The soft flexible exhaust bell more accurately mimics the soft flexible tissue of a duck's neck and tongue and the single reed toneboard will do anything from soft wheezy finesse calls to loud hail calls. The hard poly barrel is covered in Realtree's Max-4 camo so the ducks don't see you when you put them "in your face."